I’m a self-proclaimed book nerd. I currently have well over 2,300 titles on my Goodreads account, and about 85 percent of those are on my “To Read” list. In high school and college, I devoted hours to immersing myself in my favorite fandoms and writing fanfiction in which I’d be romanced by my favorite characters. While I do enjoy my share of fantasy stories and the occasional sci-fi epic, my absolute favorite stories to read are, not surprisingly, ones about books themselves and the people who love them as much as I do. 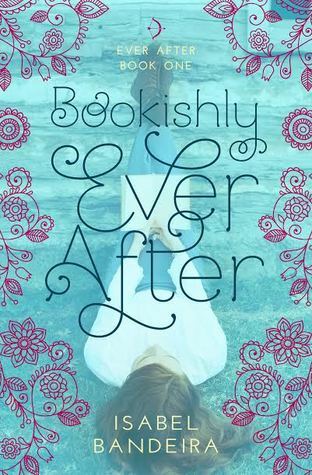 Isabel Bandeira’s Ever After trilogy details the lives of three high-school friends: Phoebe Martins, a bookworm and knitting expert; Em Katsaros, a performing arts diva with a big heart and an even bigger attitude; and Grace Correa, a cheerleader who dreams of going into engineering once she graduates. The first book focuses on Phoebe and is aptly named Bookishly Ever After; Grace’s story, Practically Ever After, is set to release in January 2019, and I can confidently say I’m very excited. Being the book nerd that I am, I was immediately intrigued by Phoebe’s story. I was merely expecting a simple story about a shy girl finding love through books, but what I got was an incredibly charming narrative about loving books and trying to use them as a road map for love, often with disastrous results. Phoebe, along with loving books and knitting, is in band with Em (her best friend) and a cute boy named Dev. Em likes to meddle in Phoebe’s life, and in an attempt to get her to live in the real world, she tells her that Dev has a crush on her. With Phoebe’s only experience with love being what she’s read in her books, she keeps a notebook with excerpts from her favorite fantasy stories and uses the main characters as a guide to how she should act around Dev. What follows is a trial-and-error saga featuring makeovers, embarrassing moments, and a will-they-or-won’t-they guessing game that kept me entertained and laughing the entire time. Phoebe is at the heart of the comedy and sweetness that permeates this story. I shared an instant connection with her love of reading and her preference to stay within the pages of books and fantasize about fictional guys, and she had me holding in laughter when she insisted on quoting her favorite books and acting more like a YA fantasy heroine. While she’s bold within her imagination, she’s anything but in real life; she often says things she later regrets and can’t read the hints that Dev is dropping constantly. Her obliviousness does get a little annoying at times, but she makes up for it with the way she is so unapologetically herself. Despite Em and Grace trying to control the way she woos Dev, Phoebe ultimately insists on following her own plans, and in the end she has to rely on herself to fix things as well. She might not be the perfect heroine, but Phoebe is relateable and fun to follow around, and I certainly enjoyed getting to know her. The supporting characters are also a strong part of the novel. Dev is the perfect mix of goofy and charming, and he even had me swooning every time he and Phoebe had an adorable encounter. It took me a while to warm up to Em, who can be bossy and a little less than kind about Phoebe’s reading habits, but her love for her friends does shine through, and it was so great to see that soft side of her. Grace is very supportive and logical, as is Phoebe’s older sister, Trixie, who has the best line in the book: “Trying to make a guy jealous by looking awesome is a waste of a good party and a good dress. Just be awesome and have a great time.” The story and characters could get cliché at times, but I loved seeing Bandeira inject little bits like Trixie’s line in between to keep things interesting. I think one of the most refreshing things about this book was that it was so positive and light. It’s very easy to get swept up in the weight of the world’s problems, and often I find that people write off books that aren’t “deep” as silly and meaningless. Honestly, we need more books like this one—more stories that are lighthearted and fun. My mood was elevated every time I opened it up to keep reading. Any book that can do that for a reader is a blessing, and I’m very glad I had the privilege to read it when I did. Practically Ever After hits shelves on January 29, 2019, and if it’s anything like Phoebe and Dev’s story, it’s sure to be a delight. You can bet that I’ll be first in line to purchase a copy. Hannah hails from Shoreview and is currently buried under a pile of unread books. Her hobbies include Funko POP! collecting, spending hours at a time at the library, and watching terrible Lifetime movies. She’s working on her first YA novel.